I duplicated and imported the second image of the tag so you could see both sides. It’s just a simple white plastic tag. You can see the CGC seal on both the tag and the bottom corner of the certificate. Go to the ePetTags.com website. Click “Canine Good Citizen” link the third item down on the left navigation bar. Choose the tag you wish to purchase and click the “add to cart” button. 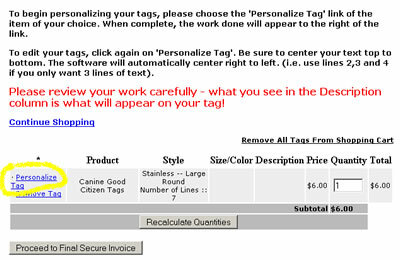 For some reason it took me a little while to see the “Personalize Tag” link (click this link to personalize the tag). I highlighted it in the image below. Add your personal information and click the “Save Tag Information” button. Click the “Proceed to Final Secure Invoice” button. Fill out your contact and payment information and click “Confirm Entered Information“. Record your order number for your records. I ordered Stetson the White tag…Why? because he already has a blue and a stainless colored tag. The ePetTags.com website is very easy to use and navigate, but if you have any questions please feel free to contact me in the comments area. 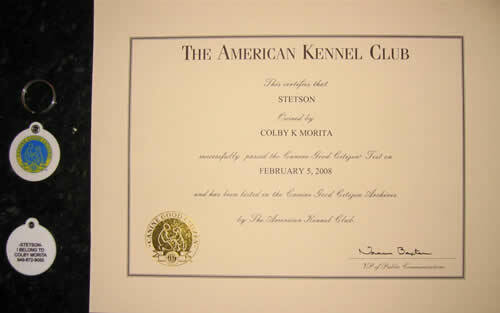 Has your dog passed the Canine Good Citizen Test? Did you get him tags and a certificate? Tags, cool! I’m gonna ask my Mum to get me one of these! @Johann, did you get your Canine Good Citizen? I remember you were looking into it. Congratulations Johann! Great job! I’m sure you passed easily you’re such a talented dog…I’ve seen your videos!